Last week, I had the opportunity to meet 85 year-old Bob Moore, tour his whole grain grinding mill in Milwaukie, Oregon (just 10 minutes south of Portland) and listen to him play and sing, “You're Nobody until Somebody Loves You” on his piano located at the mill. Even though I was fascinated about the opportunity to learn to cook many of the whole grains that Bob sells, including kamut, spelt, and amaranth (look for future blogs! ), I have decided to focus this blog on the whole grain of oatmeal. Oats have a high satiety value which means you feel fuller longer which can help you lose weight. Oats became the first food (first whole grain!) with a FDA health claim label. In 1997, a review of research demonstrated that the consumption of whole oat sources, which included oats, oat bran and oat flour decreased total cholesterol and low-density lipoproteins (LDL) cholesterol concentrations in the blood. Oats are a unique whole grain because it is high in soluble and insoluble fiber. Soluble fiber acts like a sponge, which is why soluble fiber helps decrease cholesterol. Soluble fiber can also help control blood sugars for diabetics. Insoluble fiber acts like a broom to keep your digestive tract clean and moving smoothly. If you have adequate fluid intake, oats can also help prevent constipation. Oats are whole grain. The 2010 Dietary Guidelines for Americans http://wholegrainscouncil.org/whole-grains-101/us-dietary-guidelines-and-wg recommends eating at least 50% of your grains whole grains. A whole grain contains all three parts of the grain (endosperm, bran and the germ). A processed grain has the bran and the germ removed during the milling progress and thus contains less vitamins, minerals, and fiber. 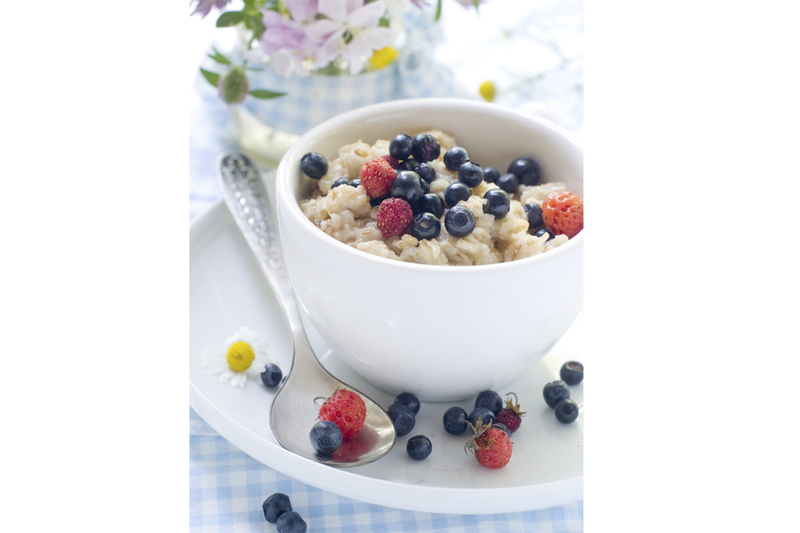 Oats are good sources of vitamin E, B vitamins, antioxidants and phytochemicals. I, personally think, there are some nutrients so small (micronutrients) that modern technology does not have the ability to isolate them yet; however, our bodies still need those nutrients. Yes, yet another good reason to eat whole grains and non-processed foods! Enjoy this new twist on morning oatmeal! Since you start the night before, this recipe is great to make ahead of time for a quick grab and go breakfast. In a glass bowl, stir together these three ingredients. 1/4 cup of nuts. I liked chopped walnuts. 1/4 cup dried fruit. I like raisins. Stir well. Cover. Place in the refrigerator overnight. You can add fresh berries (blueberries are our favorite!) in the morning or just eat it the way it is. Delicious, filling and healthy! While living in Switzerland, I thoroughly enjoyed this overnight Bircher Muesli, which I call Swiss Oatmeal. Interestingly enough, Bircher Muesli was developed over a one hundred years ago by the Swiss physician Maximilian Bircher-Brenner for his patients and is still commonly eaten in Switzerland and Germany for breakfast or a filling healthy snack. Since Bob recommends one tablespoon of ground flaxseed every day, he would even suggest adding flaxseed to your oats. With a healthy cholesterol level of 126, Bob jokes with the dietitian he’s cooking with that his cholesterol is lower than hers. She smiles and doesn’t deny it! In his biography, People before Profits http://www.bobsredmill.com/People-Before-Profit.html, Bob recalls in his younger days being criticized by his wife’s grandmother for smoking and unhealthy eating habits; now he is fascinated by healthy eating and by eating whole grains. He credits his wife, Charlee (whom he fondly calls, “The First Lady of Whole Grain”) for being a positive influence because she continued to feed him and their three sons healthy whole grains even during the 1950's when TV dinners were the rage. Make some Bircher Muesli (Swiss oatmeal) tonight! Enjoy your new grab and go breakfast!